It finally appears that more of our clients have been reading these newsletters and are taking heed of the advice being given. During the month of October, 4 of our clients’ premises at which house breakings occurred, were of the same MO as in the past few months where a window pane is removed to gain access. Each time the internal sensor had triggered and on each occasion the suspect/s fled, thus alarms are now being armed at night with internal zones being active. The areas that are still being actively targeted according to our stats are the top of Tamboerskloof, Oranjezicht and Higgovale close to the mountain. On occasion, our clients have awoken with intruders in the premises and in one or two instances actually confronted the intruder/s. There is a fine line between bravery and stupidity and our advice to you, should you hear movement within your house, your response should rather be to lock yourself in a secure room, even if you are in possession of a firearm, rather than being confrontational. Even being fully trained with a firearm will still not be a match for four armed suspects in your house. Make sure you lock yourself in a room that has a panic button, as CBAR’s reaction officers are only minutes away. Let the threat look for you as apposed to you looking for the threat. CBAR has started sending letters to clients where there are a very high number of callouts to the premises. These are only a handful of clients considering our client base. These clients are responsible for the majority of callouts at City Bowl Armed Response and result in slowing the service down due to reaction officers continually having to attend the same premises day after day. This repetition of callouts to the same premises results in an increase in operating costs to the company. Kindly ensure that should you receive such a letter, it is taken in the spirit in which it was sent and that is that CBAR would like to resolve the overactive alarm issue. With the arrival of the south easters in October, it is imperative that all foliage be cleared near or around outside beams, as these are the single biggest cause of false alarms, second to user error. From the 5th November 2013 to the 30th November 2013, CBAR is offering alarm service calls at a cost of R350.00 excluding electronic parts which may be required (Incl. VAT) as apposed to R399.00 (Incl. VAT) which is a standard callout fee (9am – 5pm, Monday to Friday excluding public holidays). If your alarm has been false alarming or has not been serviced the past 12 months, this would be a good opportunity to take advantage of our offer, especially due to the fact that many businesses will be closing and a number of homes will be vacant during the December holidays. Our control room is completely reliant on receiving an electronic alarm signal should your alarm activate, therefore…. NO alarm signal received = NO armed response call-back or dispatch. Our officers have started making a number of arrests where suspects are in possession of stolen garden furniture ranging from light weight plastic chairs to heavy wrought iron tables. Please be advised that this is a usual occurrence during summer, so stow away garden furniture when not in use, or at least remove to a less visible storage area. 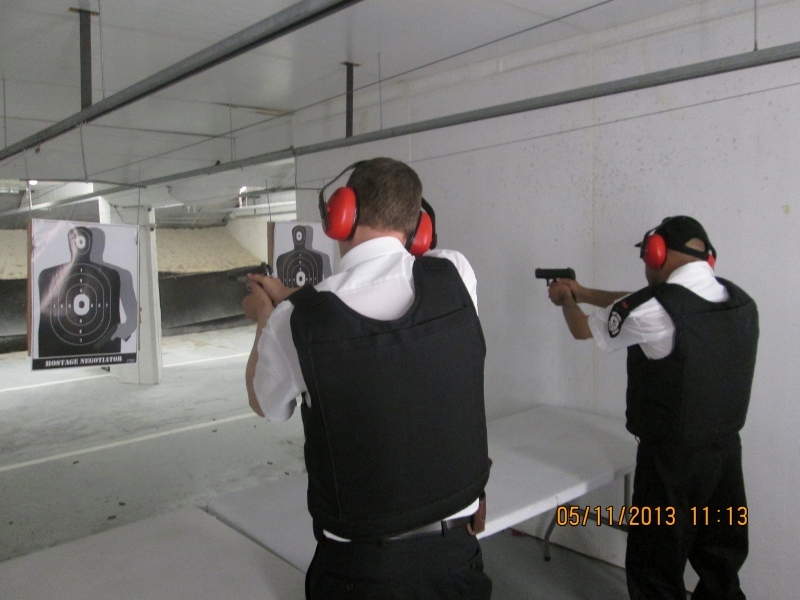 October and November also saw all armed reaction officers attending a firearms refresher course, which included safe handling and live fire exercises. This is part of the requirements of the security industry, for those companies that are SAIDSA approved as we are. For our updated crime statistics and occurrences in your neighbourhood, please visit our web-site on www.cbar.co.za.